Medford, Ore. — One local winery is using the smoky conditions in a clever promotion. 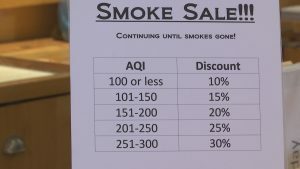 RoxyAnn Winery announced earlier this week, it is offering a smoke sale. Essentially, the worse the air quality is – the bigger your discount is on wine. The winery said with low foot traffic this summer, it’s the perfect promotion for wine lovers to get in the tasting room and out of the smoke. “Encourage people to come out even despite the smoke. But maybe because of the smoke and get a chance to get a discount on some wines and appreciation for people coming and supporting local businesses like ours,” said John Dials, RoxyAnn Winery. RoxyAnn Winery said it anticipates the promotion going for the rest of fire season. It hopes the deal will encourage more people to shop local.